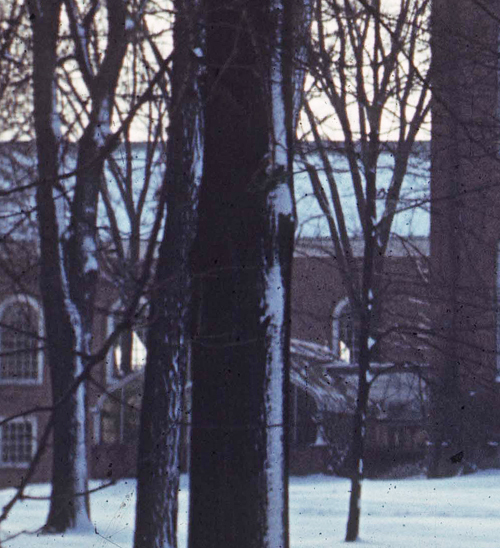 All through the history of Wabash once finds stories of alumni giving back to this school. This is a story of one such gift…from the pages of The Bachelor. 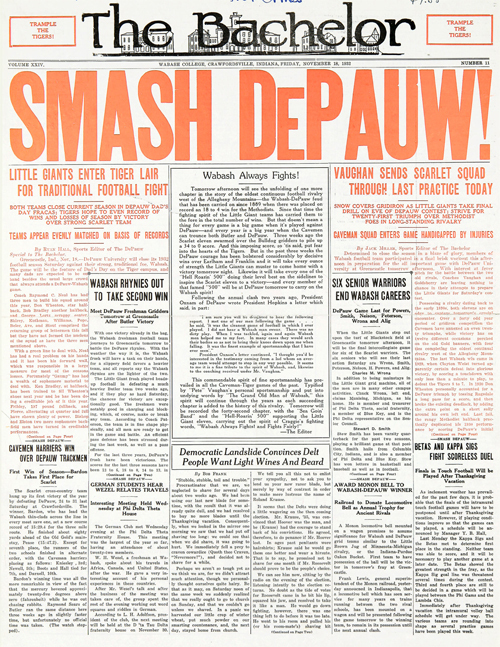 This September 16th, 1930 Registration Edition was the first paper of that school year. It reports on the happenings at Wabash over the summer, including the gift of a conservatory to be attached to South Hall. The old one having been deemed insufficient. Here is the story from The Bachelor, along with a picture of South Hall taken on New Year’s Day in 1941. The conservatory may be seen at the left of the building. Completed Structure Made Possible by Eastern Alumni Headed by D. D. Hains and H. H. Whetzel. One of the most striking improvements to greet the eyes of returning college students is the recently completed $7,500 greenhouse on the south end of South Hall. The new structure is of the most modern construction and will greatly simplify instruction in botany since it affords space for laboratory study of a great number of plants. Construction of the conservatory was made possible by a fund raised by a group of eastern alumni under the direction of Mr. D. D. Hains of the class of 1895 and Professor H. H. Whetzel, Wabash ’02, who is now head of the department in plant pathology at Cornell University. Actual work on the structure was started soon after the closing of school last spring. A full basement was dug for the building and the floor was built in such a manner that any of the many heating and water pipes may be easily reached in case they need repair. A four foot brick and cement foundation makes an excellent base for an all-steel frame which is about twelve feet from comb to base. Curved eaves make shadows impossible and ventilation is adequately arranged for. The building is divided into two compartments, one of which will be used for an experimental room and the other for a conservatory. A glass partition separates the two rooms so that different degrees of heat may be used in each. In the center of each compartment are steel benches with slate tops while the walls are lined with shelves made of steel and cypress. Two concrete tanks may be used for water[ing] plants and may also be utilized by the zoology department for experimentation. Dr. Bechtel has supervised the setting of the benches and for the past few days has been moving many of the plants from the ancient conservatory on the west side of the Hall to the new greenhouse. There were many changes to the campus that year, another article from this same issue did note however, that these were all funded by friends and alumni of Wabash, no public works projects here. It was during the Depression, yet even in those hard times, Wabash men remembered their Alma Mater. There are a handful of images of dear old Wabash that are timeless – even iconic. 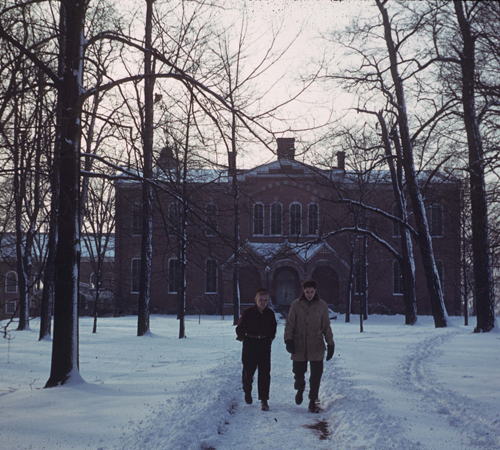 Such a beautiful picture taken by Wabash man and long-time member of the mathematics faculty Paul Mielke [W1942]. 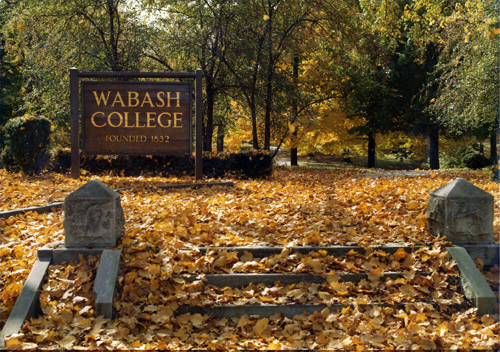 Paul was a superb photographer and this image has really come to represent Wabash College. 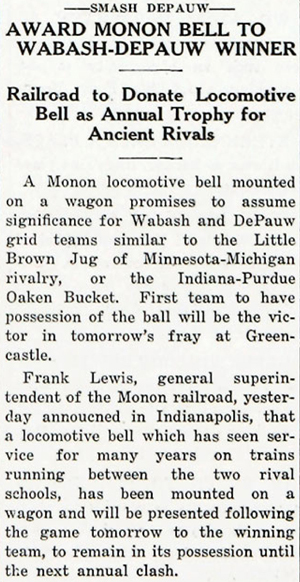 How do we know it is Monon Bell week? Well, the bell is ringing from the Chapel steps, students are sporting Mohawks while the email requests for Bell tickets are stacking up. In the spirit of Bell week, I thought I would share a piece of history about the Bell itself. Here is the headline from the Bachelor of November 18, 1932. Let’s take it to 56-53-9!